44mm dowelled external Oak veneered door. Supplied unfinished. Engineered oak construction for greater strength and stability. Available in standard imperial sizes with 10 years manufacturing guarantee. 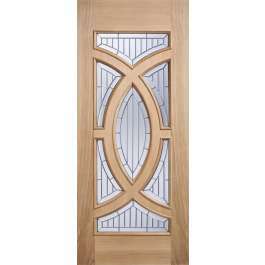 Very original, traditional style glazed oak front door, featuring a composition of circular shapes, raised mouldings on both sides and glazing panels with glass - zinc decorated clear bevelled toughened double glazing. Majestic front door will without a doubt make the house look special. Optional matching door frame - External oak door frame with cill and 6 metres of weather strip (gasket) in a self assembly kit. Optional oak weather bar - External oak weather bar, protects bottom edge of the door from rain and snow. The door can be reduced by up to 6mm from any side (12mm total in width and 12mm total in height). Trimming within these tolerances does not affect the guarantee. Only high performance exterior quality stain or paint systems (consisting of base and top coats) are allowed. We recommend using Sikkens systems or alternatively, treatments offering at least the same level of protection as Sikkens. Please do not use waxes, oils, varnishes and water based finishes as they do not offer suitable protection for engineered front doors. Furthermore, please ensure a correct application of the recommended number of base and top coats, and also that all edges and cut outs for ironmongery are equally well finished. The door set should be fully finished (sealed) prior to installation and exposure to the elements. Failing to comply with these requirements is likely to result in damages to the door set and will void it's guarantee. Additional external cover such as a canopy or a porch is recommended but not required. For more information on how to finish external door sets, please read this article.